What am I looking at? Where should I start? You will see two choices Year One Basic and Year One Detailed. The Basic list is just what it suggests – the simplest form of the list, usually giving only the first/preferred option of book choices when there is more than one choice. The Detailed list gives you various options in some cases, if you want to pick and choose. There isn't a lot of difference between the two lists for Year One – the options come more into play in the upper years. Select the list you prefer and click to open the booklist page. The subjects covered by the booklist are Bible, history, biographies, geography, natural history/science, poetry, literature, and free reading. You will notice a variety of clickable symbols next to each title in the booklist – there is a key at the top of the page to explain them. Basically they are links to various sources where you can get each book in a variety of formats – print books, ebooks, and audio books. There are also little numbers next to certain books, which link to the footnotes at the bottom of the page. Please, please take the time to read through all of the footnotes! Do I need all of these books? Yes, you really do need all the books. J The only book that is really 'optional' in Year One is Trial and Triumph (be sure to read the notes and preview this book to see how you want to handle it.) There are sometimes good reasons to substitute other books (certain history selections for non-American families, for example), and AO's format is flexible enough that it is possible to do this pretty easily. However, I caution you against making substitutions, additions, and other changes unless it is absolutely necessary. I swapped out and added in books when we first started AO, and I came to regret nearly every one of those changes. We do AO pretty much as written now – moving some books around to group read-alouds as needed since I am juggling students in three different years, but still hitting them all eventually. So…I suggest starting with the booklist as written, and go from there. If you have questions or concerns about any of the books on the list, you can hop on over to the Forum and ask there or search for past discussions. What format should I use – print or ebooks? Do I need to purchase them, or can I use the library? One of the beautiful things about AO is their vision to make a rich Charlotte Mason education available to everyone, regardless of location or budget. As such, many – although not all – of the books they suggest are available online for free as ebooks. This is a wonderful option for those who are on a very tight budget or who are overseas and have shipping restrictions. We started out using as many Kindle books as we could because we were overseas at the time so shipping was an issue, and this worked just fine. Now that we are settled in the US, we are slowly starting to collect print copies of the books and find that we greatly prefer that format. So…my suggestion? Purchase as many books in print versions as you can in your particular circumstances, and use ebooks for the rest. If you check used bookstores, library sales, and online used book retailers, you can purchase many of the books very inexpensively. When purchasing books, please consider purchasing them through the Amazon links on the Ambleside Online website. These are affiliate links and will go towards supporting Ambleside Online, which is completely run by volunteers offering their experience, expertise, and time as a gift to the Charlotte Mason community. As far as the library goes – most of these books are stretched out over the whole school year, and some of them across several school years. So for the most part, the library won't be terribly practical. The one exception would be the free reads, since these aren't scheduled – they are just offered as worthy "don't miss" selections to read as you wish outside of school time. We have used them as family read alouds in the evening, audiobooks for long car trips, and personal free reading once the children were reading well enough. What do I do with these books once we are ready to begin lessons? Back on the curriculum page, you will find links to a 36 week schedule that tells you what chapters from which books to read each week of the school year. There are charts available in a variety of formats, or you can make your own (which is what I do). 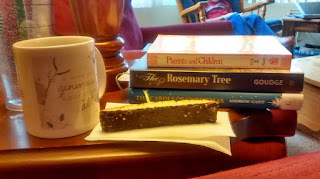 I wrote a post for Brandy over at Afterthoughts a couple of years ago on how I prep and teach a Charlotte Mason style lesson using a couple of Year One books as examples. For the most part, it is as simple as "read and have the child narrate". There are some cases where you may want to look up pictures or Youtube videos to get a visual image of something. We keep maps handy to look up the places we read about in history or geography lessons, and begin a simple timeline. But for the most part, it really isn't necessary or even desirable to add in a lot of 'extras'. The ideas are in the books themselves, and we want to let the child form their own relationship with those ideas without throwing in a lot of things that get in the way. For Year One, even for a child who is a strong reader, you can expect to be reading all of the child's school assignments out loud to them. I suggest this even for strong readers because it is important for the child to have established the skill of narration before handing off school books to be read independently.